Anna Holley is the third daughter of the Vicar of Thornwaite, a quaint village tucked up in England’s beautiful but rainy Lake District. She has returned home to her family just in time for the holidays but is a bit worried that her family will finally notice her stutter and anxiety issues. Anna had begun her social shyness back as a child after the loss of her brother but she’s done her best to keep it hidden over the years and is afraid visiting the busy Vicarage will bring out her secret. When things become a bit overwhelming for Anna with her homecoming she heads out for a walk where she finds herself heading to the local pub when it’s too cold to wander around outside. At the pub Anna meets Simon who stands out in the pub crowd about as much as Anna herself does. Before Anna knows it she finds herself unburdening herself of her worries to Simon who seems to be an amazing listener. The next day brings quite a surprise for Anna though, Simon who Anna thought she would not see again happens to be there to take over the position as Vicar from Anna’s father. 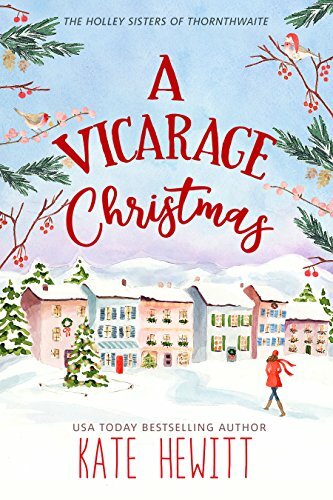 A Vicarage Christmas by Kate Hewitt is the first book in the Holley Sisters of Thornwaite series. This first book centers around Anna but I’m sure the others that will follow will be focusing on the other girls that you get glimpses of in this first read. The series seems to be a very clean romance series focusing on the daughters of the town Vicar or at least it was that way in this first book. Anna being a very shy girl obviously hadn’t much experience so it was rather a sweet read with her as the lead. This one was a very quick read coming in at just over one hundred pages so at that length I would say it’s one that I wouldn’t have minded to be a bit longer and give more depth to Anna and Simon’s story. With introducing the whole family and setting in this first book it seemed it all flew by rather quickly and ended quite quickly. Hopefully the next few books will go a bit deeper but otherwise it was a nice story.